DDACTS is back! 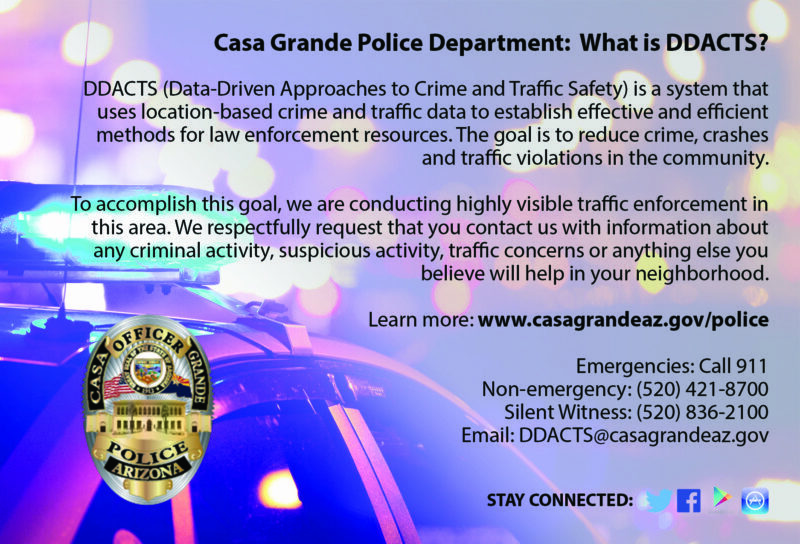 The successful Policing Crime Model implemented in 2017 will once again be utilized to address crime and traffic issues in the Casa Grande community. This implementation will begin on January 1, 2019, and end on December 31, 2019. The enforcement area is a grid bordered by French Street east to Trekell Road and Cottonwood Lane south to 2nd Street. DDACTS, a Data-Driven Approach to Crime and Traffic Safety, uses location-based crime and traffic data to establish effective and efficient methods for law enforcement resources. The goal is to reduce crime, crashes and traffic violations in the community and to improve the quality of life for all citizens in Casa Grande. This model was developed with the assistance of the National Highway Traffic Safety Administration (NHTSA), the Bureau of Justice Assistance (BJA) and the National Institute of Justice (NIJ). Analytical data for specific crimes, collisions, and calls for service within a one-mile city grid was selected based on four years of data. 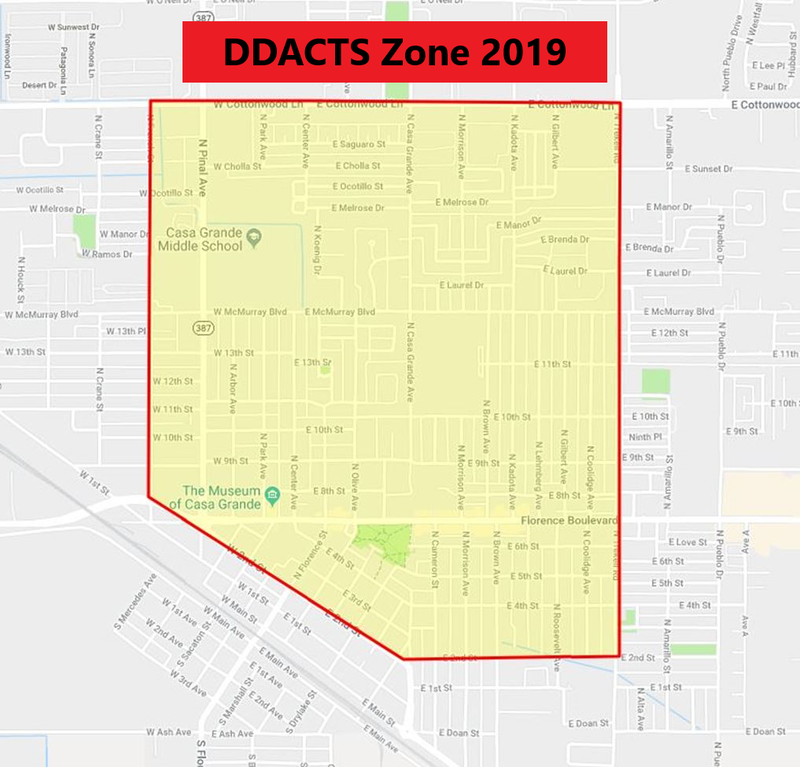 The Casa Grande Police Department is seeking a collaborative effort with citizens, businesses, community organizations, and civic leaders to effectively incorporate the DDACTS model as a permanent policing model, giving “Everyone a voice in the process”. To accomplish this goal, we are conducting highly visible traffic enforcement in this area. Our Patrol Officers will spend at least 30 minutes each during the course of their shift seeking positive community interactions and proactive policing activities. This will include a strong emphasis on supporting community engagement through community events throughout the year. The Casa Grande Police Department invites you to attend any or all future CGPD events to learn about DDACTS, what role you can play in this model and how you can make a difference in your community. We ask you to follow our Facebook, Twitter and City website for future event dates. Police representatives from various divisions will be on hand to answer your questions. Your feedback will be valuable to the success of this model.